WHAT IS CDA / OPD ? Continuous Descent Approach (CDA) also called Optimized Profile Descent (OPD) is a new way to land an airplane where you make your initial descent from a high altitude on a continuous glide path at reduced power to the runway. You essentially glide at reduced power straight down to the runway from your initial descent. CDA has been implemented in the UK, parts of Europe and in California. The FAA has also been field testing CDA at New York area airports. As a passenger you may recognize CDA when you seem to be traveling at much lower altitudes as your approach the airport without the powerful engine thrusts you normally experience before you land. Historically pilots use a "Step Down" approach procedure. This has been in use for over 20 years. Essentially the aircraft begins their initial descent and takes a series of steps. As a passenger you will feel the plane reduce altitude for a spell (step down) and then power ahead at increased engine thrush, and then lower again(Step Down), and on the final increase power on the final glide path into the airport. This landing procedure has been used for many years. Air traffic controllers and pilots are accustomed to step down procedure. Step downs are a proven noise mitigation technique to spare communities further away from airports from loud engine noise. Step Downs preserve high altitude and use increase engine power at lower altitudes for safety reasons. Step downs are a proven noise mitigation technique to spare communities further away from airports from loud engine noise. Step Downs are safer than CDA in the event of a missed landing or low altitude maneuver. The drawbacks are noise and emissions presented to communities in close vicinity of airports. Increased engine thrust on landing means increased emissions. CDA is a controversial procedure. Aviation safety experts raise important concerns with flying aircraft at reduced power at lower altitudes. The recovery rate for any kind of disturbance at lower altiudes is reduced significantly. At lower altitudes on less power, aircraft is more difficult to control due to air density. Bird strikes and engine stalls are much more likely at lower altitudes at reduced power and any last minute alterations could create an aviation disaster. Commercial aviation however wants to promote CDA (OPD) because of the fuel burn savings, and because new technology to support “Free Flight” supports CDA. They have marketed this procedure as a way to reduce noise, although it actually increases noise to many more communities. Pilots workload is increased with CDA. They require training on the procedure to minimize the associated risks to preserve safety. In the event of foul weather or icy conditions use of CDA is not recommended. Widespread use of CDA at EWR, PA and JFK will necessitate lower flying commercial aircraft over a 150-mile radius, which has important noise, environmental, and safety ramifications. Aircraft flying on CDA into La Guardia would necessitate regional traffic to Danbury and Westchester to fly at substantially lower altitudes to avoid CDA arrivals at La Guardia. The FAA wanted to implement Continuous Descent Approach (CDA) at La Guardia as part of the Regional Airspace Redesign to reduce the noise impact when they terminalized a much larger area. In the Draft Environmental Impact Study (DEIS) CDA was included however CDA failed the safety field test in the summer of 2007 and was not included in the Final Impact Study(FEIS). Nonetheless the Port Authority, commercial airlines and certain members of congress continued to push CDA as the preferred solution to jet engine noise to make use of the associated efficinecies. Due to this pressure by congress and the industry the FAA chose to include CDA in the latest implementation schedule for all the New York New Jersey airports even though it failed the safety test. 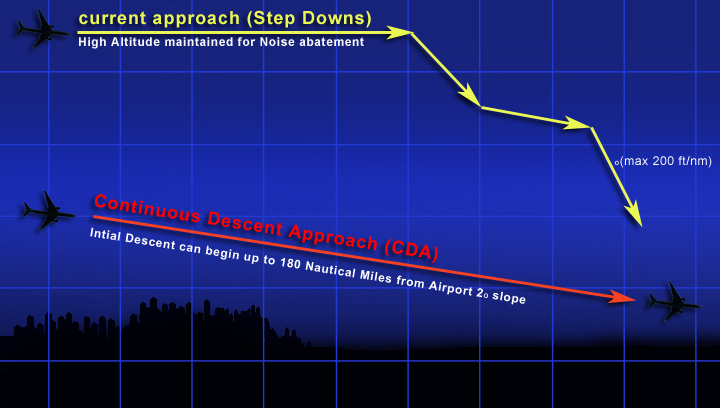 The FAA decided to rebrand CDA due to the safety and noise risks discovered oversease and in litigation so they changed the name of the procedure from “Continuous Descent Approach” to “Optimized Profile Descent” (OPD). The facts remain that implementing CDA/ OPD in a congested environment will increase noise and air pollution to more communities because aircraft will be flying at lower altitudes for longer distances. This will reduce safety to the flying public. This is the implementation schedule for OPD at LGA. According Ruth Leverenz of the FAA, OPD is also known as CDA.